I picked up this great little book yesterday called The Life-Changing Magic Of Tidying Up on home organization and I’m already half finished it so I thought I’d share a bit about it here on my blog since we Lululemon collectors tend to be magpies that hold on to our vast collections of things. Our collections make us happy, so why not find a way to enjoy the pieces we’ve collected over time instead of feeling numb to it because of the clutter it creates. I know I’m not alone in having a big pile of lulu laundry accumulating on a drying rack at any given time or a bundled up pile of headbands and lulu socks. The great thing about this book is that its full of unconventional ideas about tidying and it’s really about curating a smaller collection of meaningful things instead of hanging on to items that no longer serve us or make us happy. It’s a way to enjoy the things we have and how to let go of the things that don’t bring us joy and clutter our lives. One of the things Marie Kondo says it that storage experts are hoarders. That was kind of revolutionary for me as I’m alway seeking storage ideas for all my stuff as I feel like I don’t have enough closet or storage space. It turns out I actually do have plenty of storage, just a lot of stagnant things I don’t need to keep. 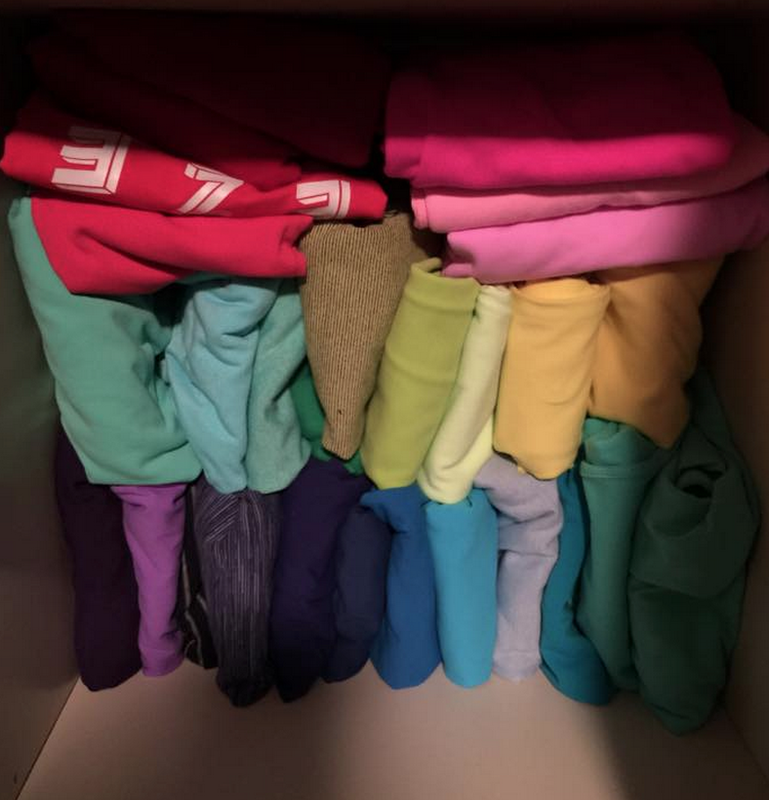 I’ll write more about the process in follow up posts but the first step is going through each and every piece of clothing you own at one time. That means going through your entire house, grabbing all the clothes, putting it in a pile and going piece by piece deciding on if I love an item and need to keep it or if I can let it go – all in one go. You are supposed to do it quickly and efficiently too, not piecemeal. Today I did all of my clothing and then folded it and put it all away according to the ‘Kon Mari’ style but now that it’s all put away I think I can pare it back more and reorganize it according to all the little ideas that Marie Kondo suggests. tomorrow I need to tackle all of my kids clothes as I feel their laundry pile is the most out of control in our house. My husbands stuff definitely doesn’t need organizing as he is an organization expert and I think he has always subscribed to this method intuitively. Ooh, I've read a couple articles on this book and seen a few inspired-by videos. Please do post more about how this goes for you. I'm interested to see it applied in real life, especially with kids (who I feel are natural hoarders, lol!) 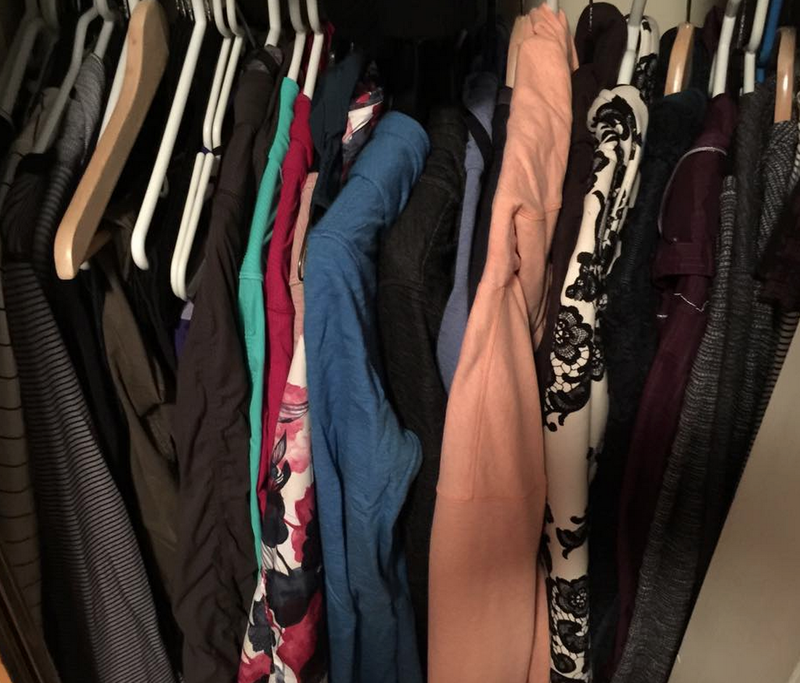 How much did you get rid of as far as clothes and Lulu goes? Was it a lot or more of a small pile? Sorry for the questions, I'm kind of obsessed with de-cluttering lately. I feel my house has began to reach max capacity of stuff!! I've become obsessed too. I'm a bit of pack rat and recently we've been going to a lot of open houses for fun (new builds that are empty, or staged homes) and its made me want to appreciate our home more. Which means doing major organizing and simplifying. I'd love to repaint our house and do some reno projects but there is no point until I can get the clutter under control. Kids stuff!! It's the bain of my existence. I have no idea how to keep my kids clothes in order since it seems they are constantly outgrowing items, or I'm storing seasonal clothing that they may or may not fit next year, storing older kids clothes for younger kid or receiving gifts of kids clothes that are too big. Plus my little one loves clothes and dressing up so she's constantly pulling stuff out of drawers and changing outfits several times a day. TOYS! so many toys. We do a toy cull right before Christmas but we aren't ruthless. One thing she says in the book is that it is especially hard for parents (moms) to purge items that belong to their children. It's like we want to make sure our kids have way more than they need so that we feel secure that they are secure. I got rid of one entire glad garbage bag today of clothing which I just dropped off at a donation bin. And I'm sure I can pair down to another garbage bag of my own clothes. Lulu clothes was probably 1/4 of a glad garbage bag that I put aside for a future blog sale and donation to a women's recovery house (they love to do yoga!). Once I'm done that I'll move to shoes before I move on to the big 'books' section of the book. I do a purge of clothing probably twice a year and have already done it with shoes but I didn't do it ruthlessly. That's awesome!!! I'm feeling motivated to do the same. I read once that it's important to remember you didn't clutter your house up in one day, so you need to remember patience with yourself while you work on it. If only there were enough hours in the day to just get it all clean at once, haha!! And I hear you on the multiple changes of clothes each day! My daughter does the same. Drives me crazy. At a certain point, you can't open the drawers anymore because it's all just a big ball of clothes smashed in there. We did a little clean out yesterday of outgrown stuff, but it is hard. I'm going to make it my goal sometime this week work on one area of my house. yes the conventional thought is that you do one room at a time, or pace yourself so you aren't overwhelmed tidying. In this book though she says it needs to be done all at once and quickly and efficiently in order to prevent 'relapse'. she does say it can take up to 6 months to get it all done. But when you are on a section, such as clothes, you do it all in one go. Clothes, Books, then paper, then miscellaneous items which is the biggest category. Oh man, I am getting fired up about cleaning and purging now!! Thanks Lulumun!! So helpful, I need to get a move on as well! I have 5 boys ranging in age from 17 down to 4 so you can only imagine the nightmare of trying to purge and organize that stretch of sizes? Then there's my Lulu…. Completely out of control with over 10 years of collecting and not enough spent purging !!!! I need that book! Very timely post, as I was planning to spend spring break Chipping away at the clutter…it's taking over our house! Of course, that would mean adding another book to the stacks I need to purge, lol. sounds great is it in paper back? I've been on a rampage trying to finish up purge of my parent's house and my crafting supplies. I probably SHOULD purge my lulu too. Thanks so much for blogging about this book. Going to order this. You can watch Kon Mari's lecture on YouTube below. This seems to be very brief idea compared to what is written on her book. Also the translation on YouTube did not appeared to be successful.